There are two kinds of perception in Angela Woodhouse’s Between: that of events at our own human scale and that of an intimate aural, visual and sensual kind. These broadly reflect the respective artistic disciplines of the two collaborators; Woodhouse in dance and Caroline Broadhead in textiles and jewellery. The challenge of creating a work based on these different ways of seeing is the space in which it is performed: theatre is designed to enlarge the small into something heroic whereas a gallery space is conceived around our relationship with what is small and can be observed up close. Between, which has been performed in both kinds of environment, requires elements of each but I suspect the Studio Theatre — a rather cavernous black box with black hangings that have been drawn in to reduce its scale — is not entirely comfortable in its intimacy. Lying on the floor as we enter the dimmed space is a body under a coat; our small group gathers round, not knowing quite what to expect. Darkness descends and a small light picks out a pair of feet traveling upright under the coat into invisibility and silence. From the same direction comes the sound of a rustling material that manifests under an intense halogen beam as an animated coat isolated against the blackness, a magical image that attunes our senses to a disembodied human scale. Between is a series of such sensory adventures creating an intimate relationship between the three dancers (Stine Nilsen, David McCormick and Martina Conti) and the standing or ambulatory audience that is both observer and participant. The role of the dancers with their pared-down gestures and calm, controlled movement slows down time and increases our powers of perception, leaving us somewhere in between theatrical experience and the intimacy of our own space, between the known and the unknown, light and dark, comfort and discomfort, clarity and obfuscation. Nilsen in a diaphanous black gown moves silently into an arena of light. Conti sidles up to her, puts her arm in Nilsen’s sleeve, then the other, slipping the garment deftly off Nilsen’s shoulders onto her self; we are voyeurs in an intimate act. The two women take turns removing and replacing the gown, accelerating the seamless transference like a dynamic sculpture. Nilsen takes a hand to her necklace and pulls it hard. It breaks and the pearls scuttle on the floor. Our aural concentration kicks in with the sudden stillness of the moment. McCormick gives Conti a similar necklace but holds on to it as they pull away from each other, stretching it to the limits of its elasticity; the sense of expectation in the space is palpable. Conti finally reclaims the necklace as she approaches McCormick with a smile and puts it on the floor while McCormick moves towards a square of light projected on to someone’s pocket. He puts his hand in the beam of light to reveal a filigree pattern of gold leaf on the inside of his hand like a decoration or a mark, shining and glinting as he turns his hand slowly, following the light’s moving path until it is extinguished. Conti and Nilsen embrace without quite touching, like a form within a form. They select a member of the audience to include within their enfolding arms and choose my daughter. It is an arbitrary choice, but the confluence of time and place in this encounter is profoundly moving for me, highlighting one of the key elements in the work: pinpointing a privileged relationship between the lives of the performers and the lives of those attending. McCormick stands among us with his arms raised, walking forward with space as his partner and returning to repeat the same meditation three times, without conclusion. Conti approaches a man to touch hands. McCormick circles Conti in slow motion, drawing her into a gentle, spiraling dance, chest to chest, arms to head, like two docile stags with locked horns. Conti circles away but moves back to McCormick whose hand is behind him like an angel’s wing. She pushes on his outstretched arm as if on a turnstile, but it is he who spins off. Nilsen leaves, leaving Conti in place withdrawing her arm from one sleeve of her sweater, then the other, her fingers slowly disappearing in the light. It appears she is turning her sweater back to front but then she takes out her slip from underneath, offers it to the woman in front of her and leaves. 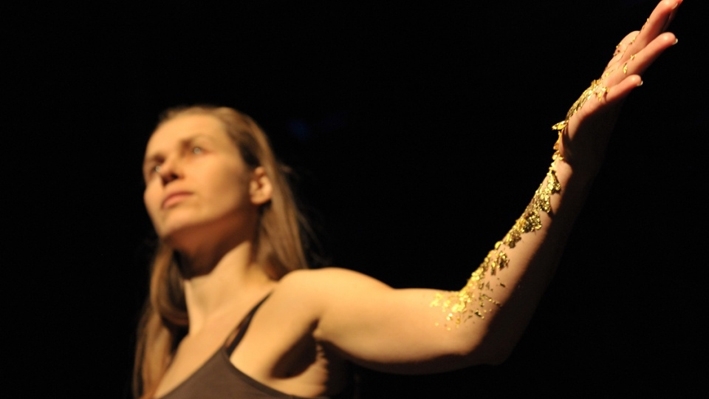 Nilsen returns to reveal a pattern of gold on her forearm. She takes the arm of a young woman and by gently rubbing their two arms together attempts to transfer the gold as a ritual gift. After Nilsen leaves, the young woman shakes her arm as if waking from a dream.